Founded in 1846, the Associated Press (AP) is a not-for-profit global news network that provides coverage of world events in text, photos, graphics, audio and video that serve thousands of daily newspaper, radio, television, and online customers. AP counts with 3,700 employees (two thirds of them being “newsgatherers”) in more than 300 locations worldwide. Yesterday, AP introduced a new logo and identity system, the first change in 30 years, designed by Brooklyn, NY-based Objective Subject. Our iterative process generated an option with a red underscore, which we dubbed ‘the prompt,’ that evokes AP’s emphasis on editorial rigor and precise and accurate approach. Setting the letterforms in black on a white backdrop proved to further highlight these values, while improving contrast and legibility. Using a consistently white backdrop further improved the strength of the mark in the variety of environments it needs to live in. We retained the original logo’s stencil lettering, which embody the gutsy and adventurous personality of an international news organization. Redrawing the letters upright speaks to AP’s integrity, while lending a more contemporary feel to the mark. Our team recommended a cooler, bolder, and truer red hue that both represents the dynamic nature of the news company, and allows a much-needed flexibility to reflect AP’s diverse array of products and services. Objective Subject’s logo exploration and final selection refinements. The previous logo has been around for so long that it’s hard to imagine anything new taking its place. It also happens to be a perfectly decent logo — easily recognizable and simple. Its main problem, whether on the web or in ink-clogging newspapers, is the thinness of its counterspaces, being too small to hold legibility at smaller sizes. Citing “designed for the digital era” in the press release, the new AP logo is clearly a more multi-platform-friendly rendition that will hold up well at different sizes. It’s easy to miss the nice rhythm and Gestalten-ish ligature of the old logo and it’s quite possible that the logo could have simply been redrawn for better performance but, let’s face it, that thing is thirty years old and I think it’s more disposable than a consumer brand icon like UPS or AT&T. The new logo may feel simple and slightly generic, but it’s concise and strong, especially with the red underscore which I feel will become more identifiable — perhaps almost like National Geographic’s yellow frame — than the “AP” characters. The logo works best against colored backgrounds or photographs as the white background gets lost in, well, white backgrounds. Overall, I think this is a welcome and positive change that establishes AP as a modern-day news network instead of a relic from the last century. 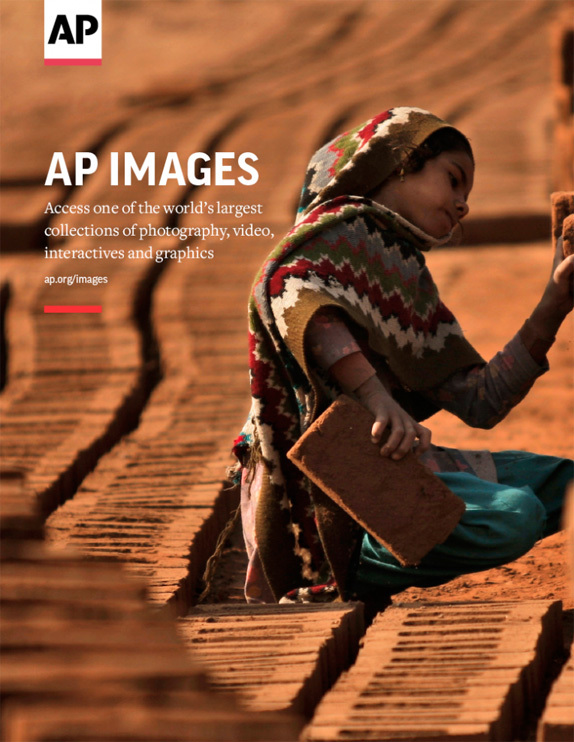 Cover of AP’s brand manual, full PDF here. Thanks to Mitch for first tip. Founded in 1846, the Associated Press (AP) is a not-for-profit global news network that provides coverage of world events in text, photos, graphics, audio and video that serve thousands of daily newspaper, radio, television, and online customers. AP counts with 3,700 employees (two thirds of them being \"newsgatherers\") in more than 300 locations worldwide. Yesterday, AP introduced a new logo and identity system, the first change in 30 years, designed by Brooklyn, NY-based Objective Subject.